On Episode 202 of CrossFit Radio, host Justin Judkins interviewed CrossFit New England owner Ben Bergeron, as well as 2011 Reebok CrossFit Games competitor and strongman expert Rob Orlando. This episode was webcast live at 6 p.m. PDT on Wednesday, Dec. 14, 2011. The WOW (Workout of the Week) is from CrossFit Local. Then immediately complete as many toes-to-bars as possible in two minutes. 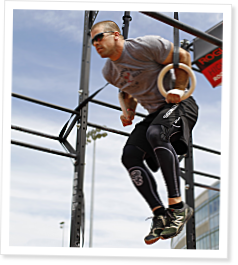 4:55 Ben Bergeron is the owner of CrossFit New England, and he was the driving force behind CFNE’s Affiliate Cup victory at the 2011 Reebok CrossFit Games. Bergeron talked about his team’s experience at the Games and what it was like to coach the athletes all year long. Recognized in the community as a great programmer, Bergeron described how he creates the workouts at his box, and he touched on CFNE’s Elements class. Finally, he described what CFNE’s training camp is and why it’s so popular. 36:40 Rob Orlando owns Hybrid Athletics and is CrossFit’s expert for all things strongman. Orlando came on the show to talk about the Strongman Seminars he conducts around the world and described how the seminars have evolved. Orlando explained how strongman movements can benefit a CrossFitter before moving on to talk about his experience at the Reebok CrossFit Games last summer. He described what happened to him during the swim and how he ended his competition on a positive note despite having to pull out of the first event. The Workout of the Week was actually created by CrossFit Durham and was the 3rd event at this past Saturday's Carolina Fitness Challenge (www.carolinafitnesschallenge.com) hosted by the same. Nate Schraeder of CF Red Point and Michelle Crawford of CF Eternal were the male and female winners. Nate finished this WOD in a blazing 6:46 with 34 Toes To Bar and Michelle in 7:07 w/32 Toes To Bar.